This book is on sale on Amazon for $2.49 (regularly $6.61) 7/14/2018 - 7/27/2018! Thirteen year old twins, Alex and Donna, are in big trouble. Their head teacher has caught them taking part in a poker game during school hours, and as a result, Nan has stopped their pocket money. 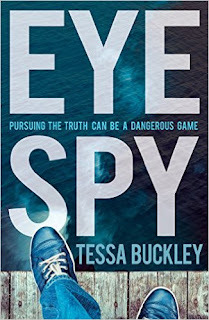 When they try to figure out how to earn some money for themselves, Eye Spy Investigations is born. Before long, they are on the trail of a valuable missing dog belonging to the glamorous Mademoiselle Boudet. But as the twins soon discover, detective work is not an easy option. They have an assortment of suspects, including a biker gang who hang out at the Starship Café, an elusive man in a fur hat, and local bag lady Kath, but which of them is the guilty party? While they sift the evidence, they are also trying to help their father sell his latest invention, a robot called Hamish. Then their investigations uncover an unsolved mystery in their own family. As a major storm hits the town where they live, and events start to spiral out of control, Alex must act fast if he is to have any chance of resolving a family crisis, saving his sister from imminent danger, and finding the missing dog.